The Daily (Maybe): But surely the police don't frame people? But surely the police don't frame people? I've been following the case of Ali Dizaei for some time now. First, second, third, fourth. In short Dizaei was a leading black police officer and activist with the National Black Police Association who was the victim of an internal investigation called Operation Helios where the Metropolitan Police Force spent millions trying to incriminate him. This investigation crossed the line many, many times. Illegal surveillance, intimidation of his family, friends and wife and ultimately presenting trumped up charges ranging from spying for the Iranian regime to overcharging on his mileage allowance. All charges were thrown out and Operation Helios became synonymous with perceived racism and corruption within the police force. Earlier this year the Met finally got their man on a new charge and Dizaei found himself stripped of his rank and sent to jail for four years. Coppers lined up to tell the media how they knew he was a bad man all along and perhaps operation Helios *had* been justified. The media lapped it all up uncritically, as if the whole attempt to frame Dizaei had never existed. So there's a new episode to a book that's meant to have had it's final chapter. Today it is revealed that the main witness in the case against Dizaei didn't exist. The Met's key witness Mr al-Baghdadi from Iraq was not who he claimed to be. In fact he was Vaed Maleki an Iranian who has since vanished into thin air. It's claimed that the evidence this witness, al-Baghdadi, Maleki or whatever we want to call him, gave was untrue and that, as a key witness, the fact that he lied multiple times under oath fatally undermines the case against Dizaei. Dizaei will be in court on Wednesday (tomorrow) seeking an appeal on his sentence which may result in a re-trial. I want to wish him the best of luck. "which may result in a re-trail." Or "re-trial", unless we're expecting to here more advance news of this before today. Good luck to the copper also. Thanks for the correction - I do appreciate them even if it's slightly annoying to see a silly mistake. 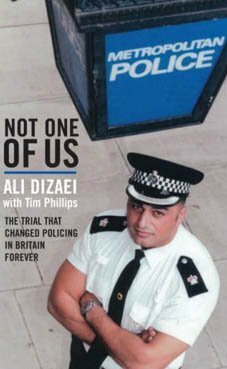 Since when, Ali Dizai has become "Black"?!?! I thought he was Iranian and Iranians are Indo-Europeans! He doesn't look Black to me!!! Lets all hope and pray........................................................................................................that he gets what he deserves and they extend his sentence. This, so called, good man, has played the 'race card on numerous occassions and was finally found to be the corrupt police officer that everyone knew he was! He has hidden behind the race card and palyed it every time he wasnt good enough for promotion. Good riddance we all say!